Dr. James Pula will speak on the effects of WWII on Poles with specific emphasis on Gdansk, Warsaw, and Krakow, three cities we will be visiting. He will discuss stages of immigration motivated by historical and cultural events in Europe that affected Poles directly. James S. Pula is a Professor of History at Purdue University, Northwest specializing in immigration studies and nineteenth century U. S. history. He is the author or editor of over 20 books and more than 100 other works including the recent Immigration & Immigrant Communities (1790-2016) from Grey House Publishing (2017). He served as editor-in-chief of The Polish American Encyclopedia that the American Library Association selected as one of the best reference sources of the year. Awarded the Oskar Halecki Prize 3 times for his research publications, his other recognitions are the Mieczysław Haiman Award for scholarly achievement; the Distinguished Service Award from the American Council for Polish Culture; the Rudewicz Medal for scholarly research; the Tadeusz Kościuszko Medal from Polonica Technica; the Gambrinus Prize in History from the Milwaukee County Historical Society; and the Officer’s Cross of the Order of Merit of the Republic of Poland. 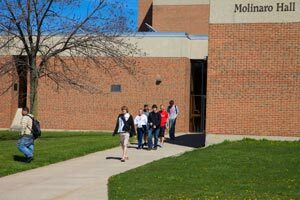 Molinaro Hall provides offices for liberal arts faculty as well as laboratories and classrooms for the College of Business, Economics, and Computing, and houses a newly remodeled space for a ceramics and sculpture art studio.